Dapoli is a small town in the Ratnagiri district of Maharashtra. Located at an altitude of 800 ft above sea level, Dapoli has one of the longest stretch of beaches from Dabol in the south to Kelshi in the north. With so many beaches and spiritual and historical activities to indulge in, Dapoli has something to offer for everyone. Located at a distance of 215 km from Mumbai, Dapoli houses one of the largest agricultural universities in India - Dr. Balasaheb Sawant Konkan Krishi Vidyapeeth. It was used by the British to set up their camps and is, hence, also known as Camp Dapoli. Dapoli remains cool throughout the year and has, hence, earned the name Mini Mahabaleshwar. Dapoli is the birthplace of the social reformer and Bharat Ratna awardee, Maharshi Dhondo Keshav Karve. Best time to visit Dapoli: The best time to visit Dapoli is from end of October to mid-February. However it is recommended to visit Dapoli during monsoons as it offers lovely sights and the landscape is simply breathtaking. How to get to Dapoli? By Air: Chhatrapati Shivaji International Airport at Mumbai is the closest airport to Dapoli. It is at a distance of 230 km from Dapoli. A taxi will help you get to Dapoli from Mumbai. By Train: The railhead at Khed is the closest railway station for Dapoli. It is at a distance of 29 km from Dapoli. Route 1 - Mumbai - Rasayani - Kolad - Mangaon - Dapoli via Bangalore-Mumbai Highway/Mumbai Highway/Mumbai-Pandharpur Road/ Mumbai-Pune Highway. This covers a distance of 225 km and takes 4 h 48 min to reach. Route 2 - Mumbai - Thane - Rasayani - Mangaon - Dapoli via NH 66. This covers a distance of 268 km and takes 6 h 45 min to hit Dapoli. Since Route 1 is shorter and convenient, we recommend you choose Route 1. Mumbai to Rasayani is 53 km in distance. It would take approximately an hour and forty minutes to reach. Rasayani is located in the district of Raigad in Maharashtra. Karnala Bird Sanctuary located near Rasayani is a relatively small bird sanctuary, but has about 222 species of birds. Of this, 161 are in-house species and 46 are migrant variety. Some of the birds spotted here are Malabar grey hornbill, Small Sunbird, Malabar parakeet, Nilgiri woodpigeon, Malabar lark, etc. This sanctuary also houses Karnala Fort. This fort is a protected monument that is covered in lush greenery. The fort was most likely constructed by the Devgiri Yadavs in the 1400s. The ruins of this fort serve as a popular hiking and trekking destination, especially during the monsoons. It has two forts, at two different levels. There's a watchtower in the middle and a temple dedicated to Goddess Bhavani at the bottom of the fort. Irshalgad is an amazing trekking destination which is made accessible by hiking up a mountain peak that has stone ruins of a fort and fabulous views. Next place en route Dapoli is Kolad at a distance of 81 km from Rasayani. It takes around 2 h to reach. Kolad has a bunch of activities for adventure lovers. Right from rafting on the swift waters of river Kundalika, trekking to Ghosala Fort, trekking on Plus Valley and hiking up Janjira Hills to reach Kuda Mandad Caves, Kolad soothes the heart of an adrenaline lover. Mangaon is just 21 km from Kolad. It takes thirty minutes to reach. Singhad Fort is a humongous fort that stands tall and mighty as a testament to the battles fought in it. It has memorials of Tanaji Malusare and Chhatrapati Rajaram (third son of Chhatrapati Shivaji). Raigad Fort is situated atop a hill, near Mangaon. This fort was the capital of Chattrapati Shivaji in 1674 when he assumed throne of the Maratha Kingdom. Dapoli is around 83 km and 2 h away from Mangaon. Dapoli serves as an amazing sightseeing destination. It has many beaches and temples to attract the old and young alike. There are many water sport activities on the beaches and Dapoli has the most authentic Konkani seafood cuisine. Dapoli has some lovely and secluded beaches in Maharashtra. A film of white sand covering the black sand underneath is atypical of the Dapoli beaches. 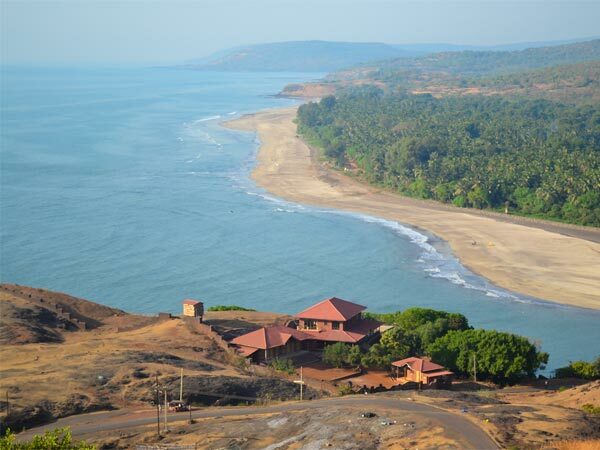 Some of the must-visit beaches in Dapoli are Karde Beach, Ladghar (also known as Tamas Theertha) Beach, Murud Harnai Beach, Kolthare Beach and Dabhol Beach. Unhavare is a hot spring near Dapoli that has traces of sulphur in it. This is said to be extremely beneficial in curing skin ailments. These hot springs have ample shelters for bathing. These caves were discovered in 1970 and are filled with gorgeous art and exquisite craftsmanship from the Buddhist era. It is not crowded but is a delight for anyone who is historically inclined. There are a total of 29 rock-cut caves on the banks of the river Kotjai. This temple near Dapoli is famous for its rare sighting of the trunk of Lord Ganesha on the right side. The temple was first constructed with wood and then reconstructed in 1780 again. This temple is famous in the Dapoli area. Kanakadurg and Suvarnadurg forts near Dapoli are gorgeous sea forts. Suvarnadurg Fort, surrounded by water on all sides, was used by the Maratha Navy as the base for ship building. Kanakdurg Fort, a sub fort of Suvarnadurg Fort was constructed by Shahu Maharaj and offers beauteous views of boats and the Suvarnadurg Fort. Located in the heart of lush grasslands and a rivulet, Shree Keshavraj Temple is located amidst plush coconut, mango and betel nut trees. This temple is dedicated to Lord Vishnu. After a small trek, one can reach the temple and offer prayers to Lord Keshavraj. The natural spring is said to originate from the bark of a tree and flows perennially.